Over the summer I’ll put fresh corn in just about everything. Compared to canned or frozen corn, it’s basically a different vegetable – crisp, sweet, and juicy. When I’m home in Vermont, we find the best corn at a local farm stand on the side of the road. Payment is cash only, dropped in an old coffee can nestled among the fresh, perfectly misshapen squash and cucumbers. Here in Boston, I buy my corn in the grocery store. Although it’s not as fresh as it is in Vermont, it still beats the frozen or canned version. This guacamole recipe is a great way to use leftover corn on the cob (if you have any, that is!). I also added a few stalks of celery I had in the fridge, which added the perfect amount of crunch. Mix up your guacamole by adding extra vegetables – bell peppers, tomatoes, or even carrots. In a medium saucepan (wide enough to hold an ear of corn the long way), boil 1 inch of water. When the water is boiling, add 1 ear of corn (husks removed) and cover the pan. Steam, turning once, for 7 minutes. Set aside to cool when done. This is also a great way to use leftover corn on the cob. Meanwhile, cut 2 avocados in half and remove the flesh – saving one pit. In a mixing bowl, combine avocado, ¼ cup diced red onion, 2 diced celery stalks, juice of 1 lime, ¼ teaspoon salt, ¼ teaspoon pepper, a handful of chopped cilantro, and a dash of your favorite hot sauce. Using a large wooden spoon or a potato masher, mix ingredients together until it reaches your desired guacamole consistency. When the corn has cooled, cut the kernels off the cob and add to the guacamole mixture. Mix and enjoy! Store leftovers in an airtight container with the avocado pit – it keeps the guacamole fresh and bright green. Yield: 8 servings. Serving size: ¼ cup. Per Serving: $0.81, 88 calories, 7g fat, 7g carbs, 1.5g protein. 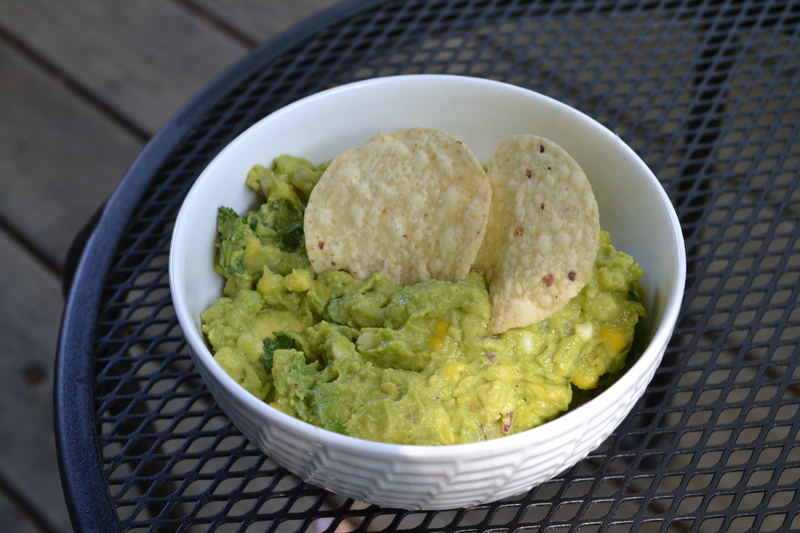 This entry was posted in Snacks, Vegetarian and tagged avocado, chips, corn, dip, guacamole, vegetarian by cooklikekayla. Bookmark the permalink.